I confess. I've always been a humorist. It is not an accident that the Flounder is usually shown with a smile. I've decided to put up some of my works here. 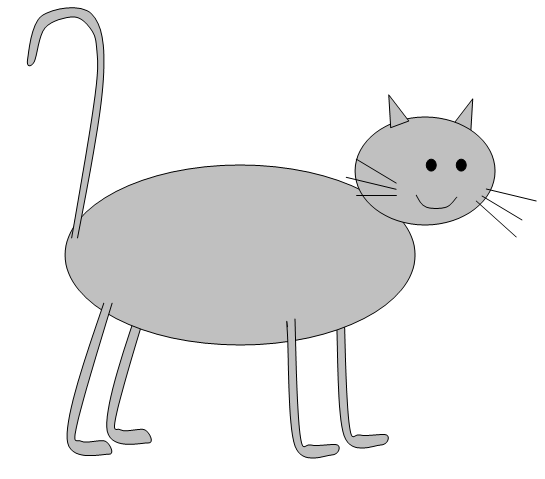 Perhaps the longest-running joke is the Adventures of the Little Gray Cat and The Flounder, a series of cartoons about the unlikely events that happen to, or don't happen to, or might happen to, or are complete fiction about, the inhabitants of a particular domicile on Kirtland Street (although, in fact, the series precedes our owning our own house by about seven years...). I've been drawing Gray Cat Plates since 1970, and there are now several thousand in the collection. Only recently have I been creating them on the computer, so only the computer-based plates will be shown here. I also have a weakness for writing parodies, often based on Gilbert & Sullivan. Some of these are so "in" that they are comprehensible only to Bernadette and me, but I present them anyway. I also like Dr. Seuss, and have done a couple Dr. Seuss parodies. If you have an interest in doing this sort of thing, a useful Web site to know about is www.rhymezone.com. If you look at my Internet connectivity from hotel Wi-Fi, it probably has the most hits. It is nearly the only Web site I visit while traveling. Here is an unordered set of my humorous works. a celebration of the Gray Cat receiving her Ph.D. in 2002 The Battle Mew of the Republic There are few things more terrifying than the sight of a Bored Gray Cat. This song was written as part of the celebration of her Ph.D. The Modern-Day Librarian I was driving off to a concert one day when the first couple lines of this song popped into my head. I had to find someone in the office before the performance and beg for a couple sheets of paper, and spent all of the time before the concert and the entire intermission writing the first draft of this song. Of course, like most of my songs, this is about my favorite Gray Cat. The Botanical Librarian What is a good career choice? A botanical librarian is not a bad career, and Bernadette worked at the Hunt Institute for Botanical Documentation for seventeen years. Oh, Mew, Mew! Recounting the trials of a Certificate student contemplating going on for her Ph.D.
Cat Not Nice Describing the dangers of annoying a Gray Cat when she's having a bad day. Poetry If I wrote a view What would have happened if Theodore Seuss Geissel had been an MFC programmer? This story came about by my thinking of the first couple lines. It took two years to get around to completing it. If you have a copy of "If I ran the Zoo" you might find it amusing to compare the two. When I sang it to Kate Young, one of the actresses in the season and a friend of many years, she suggested a second variation to replace the standard pre-concert announcements. They didn't actually use it, but it was fun to write. The Stegosaurus Song In the original budget for the new Dinosaur Hall at the Carnegie Museum of Natural History, there wasn't enough money to clean and remount the stegosaurus. While eventually such money was obtained, this song was prompted by the problem of what to do with the stegosaurus while the construction of the new hall was underway. The Diplodocus Song We'll never see its like again on this planet. This lament about Diplodocus Carnegeii commemorates this large creature. The Cat Towel Dance What do Gray Cats do for amusement? What Blog is This? This is the result of some research funded at the Flounder Institute, and demonstrates that blogging is a far more ancient art than had been supposed. The archetypal tale of a mysterious visitor who appears unannounced, makes extravagant demands of the protagonist and then disappears, having effected a life-changing experience, is re-told in the recently published graphic novel, Green Bits on LAN. Taking its inspiration from the timeless work of Dr. Seuss, this story places two familiar characters in a collection of improbable circumstances and under the typical inflated Seussian headgear. Overall the graphic design is a triumph of clip art, subtly distorted to serve the twisted needs of the author/illustrator. Sensitive readers will sympathize with our hero’s slowly succumbing to the cheerfully insistent demands of the mysterious visitor that he try reading Green Bits on LAN. His resigned response “If you will let me be, I will read them. You will see” is a prelude to the great literary epiphany that he really does like reading Green Bits on LAN. The reader closes the book, grateful to escape from the conflict and exhausted by the visual overload of the story. From "On Books: This Year's Best" from The Gray Cat Gazette, December, 2006. The epic saga of Sam McGee was first recorded by Robert W. Service. The story is about a misplaced resident of the Yukon, someone who is never happy with his role in life, but, who in briefly departing it, finds a new realization of the meaning of friendship. His companion, “Cap”, a very sincere person, is driven by forces of personal integrity to see that Sam McGee’s wishes are fulfilled, and succeeds in this in a measure beyond any expectation. As performed by the Kirtland Stree Players. Little Gray Cat: The Saga Continues Recounting the Adventures Of The Little Gray Cat in getting her Ph.D.
Spring Planting The adventures of Spring Planting, including the Gray Cat's solution to her problems. There is also a follow-up plate to this series. The Water Heater incident Flounder went to take a shower and found no hot water. Essays Hoosier than what? A commentary on two articles written by Dave Barry, in the Dave Barry style. Cartoons The Adventures of the Little Gray Cat and the Flounder A collection of the activities, real or fantasized, of the inhabitants of 610 Kirtland Street. 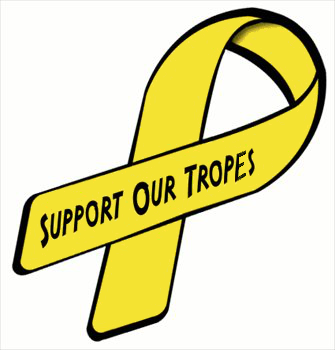 Support our Tropes I made this for Confluence, the Pittsburgh science fiction convention, and handed out samples. See the copyright notice on the page for rights of usage and permissions. The Battle Hum Commemorating an infamous Ph.D. qualifying exam in the Spring of 1971.